Do you allow yourself the luxury of daydreams? It is dreams that allow us to expand our vision of who we want to be and how we would like for our lives to unfold. Often, we allow past disappointments to prevent us from engaging in the power and magic of dreams. Without dreams, what is the point of our existence? Are we simply going through the motions? Don't lose the desire to expand--to make your life bigger than it is--stepping into your full power and potential. Take ten minutes today to dream. Begin the new year with aspirations for expansion. Engage the highest vision of your potential and possibility. Success or sabotage? Success is an expansion of consciousness; it is only when you reach beyond your perceived limitations that you will fully access it. Is this going to be an incredible day? What is your dream for today? Do you really think that dreams are mere coincidence? Isn't it odd that one dreams of becoming a global peacemaker while another dreams of becoming a writer? Your dreams are a glimpse into the power, possibility, and truth of your being. One of the incredible gifts of dreams is that they can be programmed to respond to our desire. If you were asked to focus on your life as you want it to be--RIGHT NOW--you would have the ability to visualize your ideal life. With practice, you would be able to arrive at your dream state in minimal time, with all of the texture and emotion of a true life experience. Your brain and body respond to your command; they are unable to discern fantasy from "reality." You can literally use dream states to improve your emotional and physical condition. Today, take a moment to dream your self into your highest possible vision of you. See yourself as you will be when you have reached your highest possible potential. How does it feel? How do others see you? How do they respond to you? How does this exercise increase the productivity of your day? Success or sabotage? Success begins as a dream and eventually crosses the bridge to our "reality." Silence the well-intentioned voice of your disciplinarians! Dreaming is not a childish waste of time, it is a duty for which we should all become more responsible. Only if you dream are you able to stretch beyond the perceived limitations of your story. Only if you dream can you be all that you need to be to live a life full of possibility and adventure. Dreams are at the root of growth; they are the water that nourishes the seed. Awaken to the potential that is within. What would you be if you lived without limitations? What would your life look like if you had all that you desired? Take some time today to go within and examine the desires of your heart. Entertain the probabilities rather than disregarding the magnificence that lies within you. There is a reason why you have these dreams! If Edison, Einstein, Ford or the Wright Brothers had not dreamed, where would we be today? All of the materials to create their inventions existed in Ancient Rome, yet it was hundreds of years before they were brought to fruition. Every time that one follows their dream and makes the impossible probable, the consciousness of the entire planet is shifted. Would you rather be the sheep or the Shepard? Success or sabotage? You have everything that you need to succeed at this moment. Is this going to be an incredible day? Bring your dreams into reality and watch the magic unfold! Have you ever stopped to wonder why you have specific desires or wishes? We can safely assume that not everyone on the planet shares identical dreams. Why do you have your specific wish? Do you really believe that wishes are arbitrary? 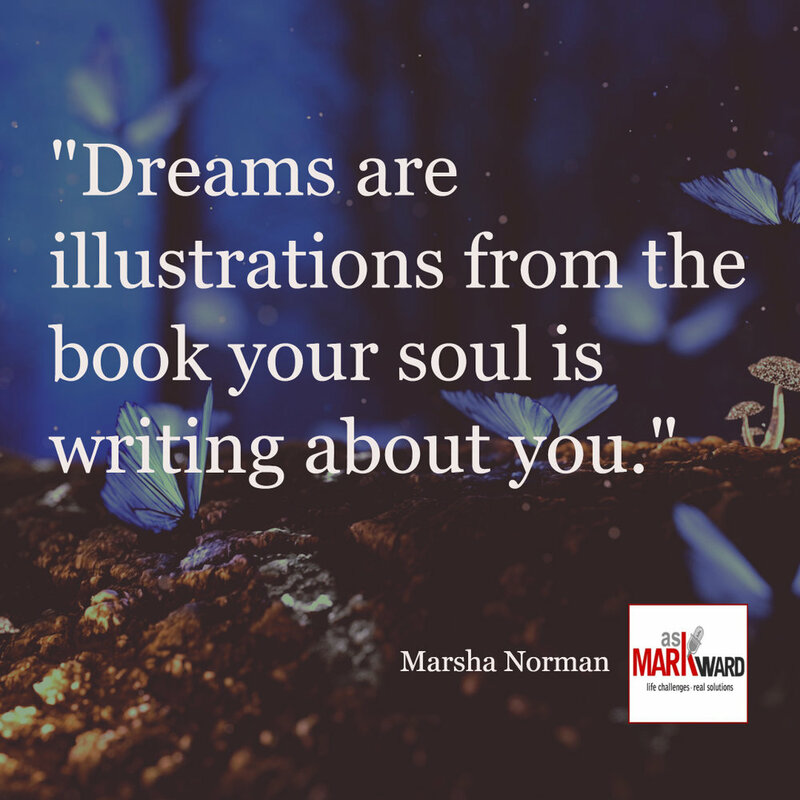 If you believe that there is a link between your soul and your wishes (if you believe in callings), doesn't it seem logical that you would also have the power to make your wishes come true? Do you fool yourself into believing that it is only true for "other people"? What is the wish or dream that you have put aside? What is the yearning that you deny? Declare your wish and take ownership of it in your thoughts. What is ONE THING that you can do today (yes, today) to move one step toward the fulfillment of your wish? Do you think that dreams are mere coincidence? Isn't it odd that one dreams of becoming a world peacemaker while another dreams of becoming a writer? Your dreams are a glimpse into the power and possibility of the truth of your being. Keep your visions and your dreams close to your heart. One of the most prevalent forms of self-sabotage is sharing your dream or vision for your life with a person that is not completely supportive. Your friends and family may be well intentioned and loving, but they may unintentionally question the validity or possibility of your dream. This will only serve to support any stories of limitation and unworthiness that you may be carrying in your unconscious. You probably would not take a kitchen knife and intentionally slash your finger. You have too much respect for your finger. You don't relish pain and know that this act cannot possibly serve you. Have the same respect for your dream. It is yours to nurture, manage and grow. If you feel that you must share your dream/vision, do so with those that you know will be supportive in every capacity. If you formed a support team of people that you know would help you in achieving your goals, who would be on your team? What would their roles be and how would you evaluate their success? Success or sabotage? Are you managing yourself effectively for greater success? The only limitation, no matter what your goal, is your self. Is this going to be an incredible day? Manage what you take in; keep your mind free and clean of negativity, doubt and fear and watch the wonder that unfolds before you.